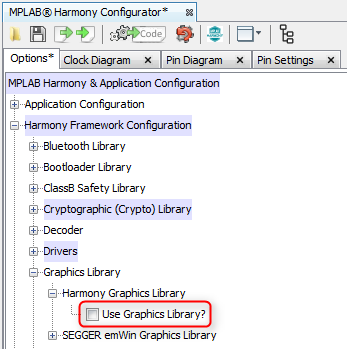 In MHC's "Options" tab, expand the Harmony Framework Configuration > Graphics Library > Harmony Graphics Library selection tree. Check the "Use Graphics Library?" box. 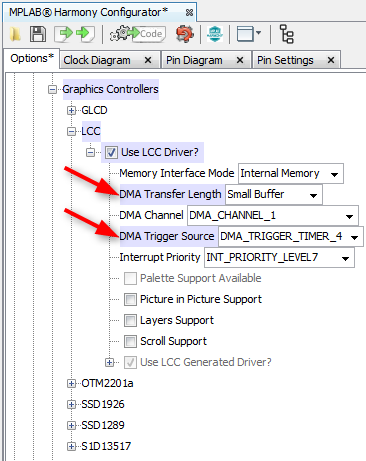 In MHC's "Options" tab, expand the Harmony Framework Configuration > Drivers > Graphic Controllers selection tree. As you have enabled the Graphics Library, the MHC enables the Graphics Controller automatically. And as you have selected the BSP for this project, the BSP takes care that the appropriate graphics controller for the hardware is selected. As we selected BSP related to MEBII board, the MHC selects the LCC as the graphics controller. Look into the below graphics for the Graphics Controller configuration. Either Timer2/ Timer4/ Timer6/ Timer8 can be used as a trigger source for DMA operation. As Timer2 is used by the camera module, change the "DMA Trigger Source" to DMA_TRIGGER_TIMER_4. Change the "DMA Transfer Length" to Small Buffer.